As a 10th-grader at Woodland Hills High School, Antwon Rose II wrote a poem describing his fear of violence in his community. “I see mothers bury their sons; I want my mom to never feel that pain; I am confused and afraid,” he wrote. Two years later, on June 19, 2018, the 17-year-old from Rankin was shot and killed by an East Pittsburgh police officer as he ran from a traffic stop. His words were recited and chanted as protesters took to the streets for at least a month after his death, demanding that the officer, Michael Rosfeld, and those in charge of him be held accountable for Rose’s death. The jury that will decide whether Rosfeld was justified in shooting Rose that evening will be selected this week at the Dauphin County Courthouse in Harrisburg. Jury selection begins Tuesday. Next week, the jury will be bused to Pittsburgh to hear arguments and testimony at the Allegheny County Courthouse in a trial scheduled to begin March 19. Rosfeld is charged with one count of homicide. He has stayed out of jail on $250,000 unsecured bond and electronic monitoring. “The family feels that if the criminal justice system works in the manner that it is intended to work, a conviction against Rosfeld is imminent,” Fred Rabner of Rabner Law Offices, which is representing the parents of Rose in a related civil case, said last week. At 8:27 p.m., police responded to a report of a drive-by shooting on Kirkpatrick Avenue in North Braddock, where witnesses give a description of the vehicle involved – a gold Chevrolet Cruze. Thirteen minutes later, Rosfeld conducted a traffic stop on a gold Chevy Cruze with gunshot damage to its back windshield. As he ordered the 20-year-old driver – who was acting as a jitney driver – to the ground, Rose and Zaijuan Hester, both 17 at the time, ran from the stop. Rose had been in the passenger seat; Hester was in the back passenger seat. Rosfeld opened fire, hitting Rose, three times. He was struck in the right side of his face, in his right elbow and in the middle of his back. The wound to the back was fatal, according to the complaint. Hester was not struck and kept running. While doctors at UPMC McKeesport hospital worked to save Rose, a video from the Facebook user Shauny Mary began circulating. It showed Rose running from the vehicle and quickly falling to the ground as he was struck. Witnesses in East Pittsburgh told detectives that Rose was unarmed when he was shot, with several saying they saw him pause as he got out of the car and briefly show his hands. Rose was pronounced dead at 9:19 p.m.
Rosfeld had been sworn in as an East Pittsburgh officer less than two hours before the shooting occurred. Despite pouring rain, protesters gathered outside the East Pittsburgh Police headquarters June 20, the evening after the shooting. The rain-drench demonstration touched off weeks of protests that shut down major roadways and disrupted traffic throughout the city of Pittsburgh — Downtown, the Hill District, North Side and South Side — and the eastern suburbs, including East Pittsburgh and Homestead. Protesters urged the public to vote Allegheny County District Attorney Stephen A. Zappala Jr. out of office. They requested that the state attorney general take over the case. They demanded charges and an indictment against Rosfeld. On June 21, nearly 200 people marched from East Pittsburgh to the Wilkinsburg entrance to the Parkway East, shutting down the roadway for over five hours. Protesters were cleared at about 2:20 a.m. Friday morning as police moved in. One person was arrested. Protesters continued to shut down roadways and violent encounters between protesters and the public became more frequent. A brief break from protests came June 24 as family and friends held memorial services for Rose. Family and friends described him as an honors student who worked two jobs, volunteered in the community and had a bright, wide smile. 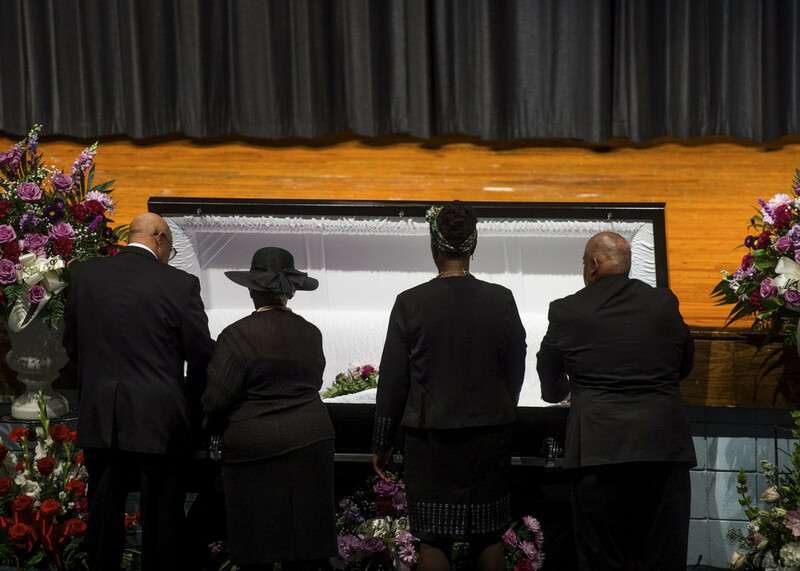 Funeral home employees lower the lid on the casket holding Antwon Rose prior to his funeral service at Woodland Hills Jr. High School on June 25, 2018. 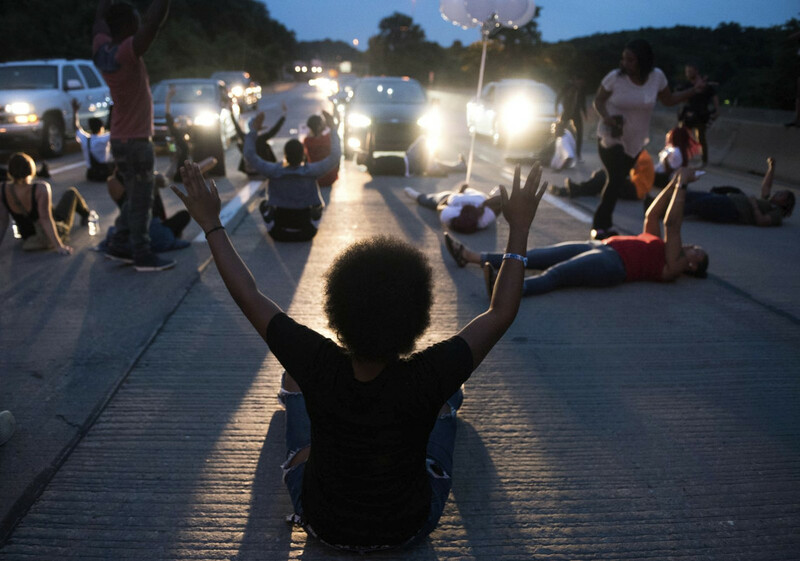 Protests and rallies are expected during the trial, as well as after depending upon the outcome. 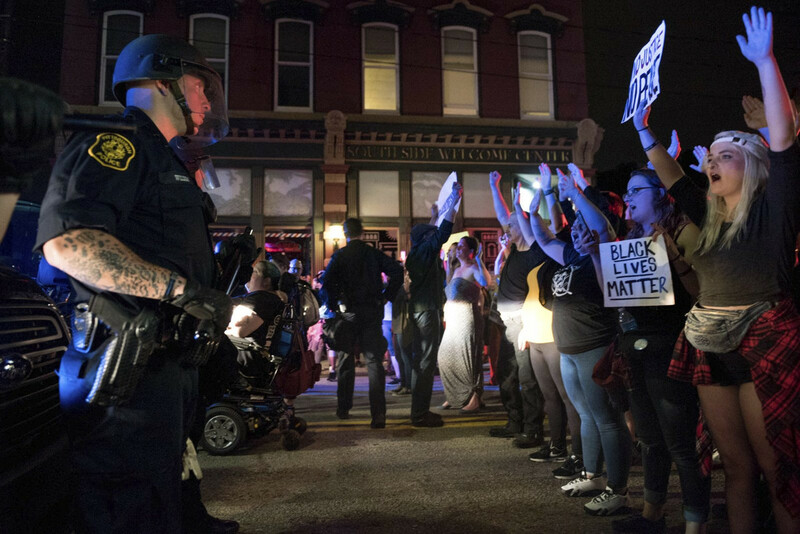 “Antwon Rose Jr.’s family has maintained a level of decorum throughout this tragedy that is commendable and they would expect that people either protesting or showing support would model their decorum as well as solidarity,” Rabner said. 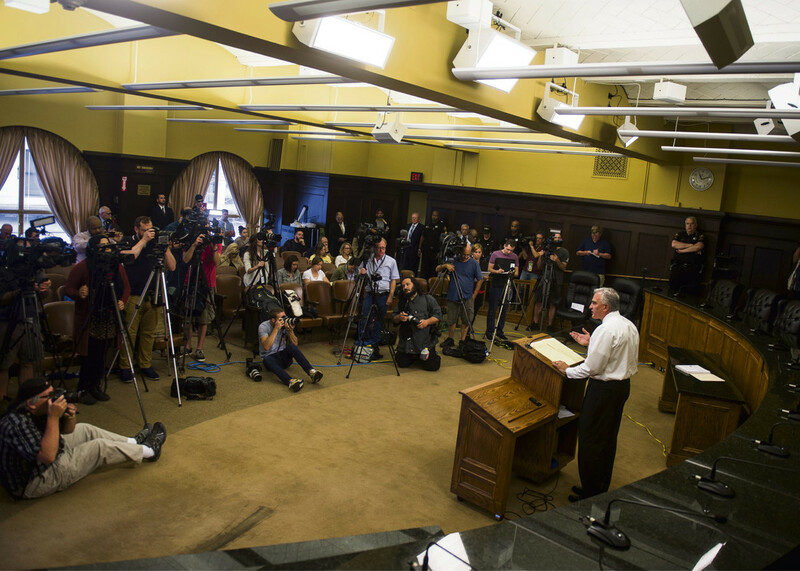 Amid the protests, Zappala announced the filing of a homicide charge against Rosfeld on June 27. He further confirmed that Rose did not have a gun in his hand as Rosfeld, in one of his versions of events, said he thought he saw. In the criminal complaint filed against Rosfeld, investigating officers noted that his explanations changed. Rosfeld told the detectives that the front seat passenger ran and “this person turned his hand toward (Rosfeld) and he … saw something dark that he perceived as a gun,” according to the complaint. Asked to go over the events again, Rosfeld allegedly told detectives that he did not see a gun when the passenger ran. “Confronted with this inconsistency, Rosfeld stated he saw something in the passenger’s hand but was not sure what it was,” detectives wrote. Investigators later revealed that Rose had an empty gun clip in his pocket. After Rosfeld’s attorney, Patrick Thomassey, argued the jury pool in Allegheny County was tainted by sensational media coverage, Judge Alexander Bicket approved bringing in a jury from a different county. The District Attorney’s Office tried to have Thomassey held in contempt after he blurted a remark in open court alleging Rose was involved in an armed robbery earlier the day of the shooting. Bicket did not find him in contempt, but he did order the transcript of the hearing be made public. Chief Deputy Trial Attorney Daniel E. Fitzsimmons in January pushed for evidence found after the shooting — stolen guns in the vehicle, gunshot residue on Rose’s hands — to be made inadmissible, arguing that Rosfeld couldn’t have known those things when he pulled the trigger. As of Friday, Bicket had not yet ruled on the admissibility of such evidence.